Opera as Opera is a challenging, wide-ranging book that is not a history of opera but a comprehensive examination of opera's essence, i.e. performance. The book, in Mr.Osborne's words, "proposes engagement with performance, and what goes on in that engagement, as not only a serious way to consider opera, but the most serious of all." He starts by exploring, in fourteen short essays, the most basic elements of opera as sung action, as well as the very nature of artistic encounters - for the creator, the interpreter, and the "receptor". He then proceeds to chapters on production and creation, intellectual background, and many more dealing with myriad aspects of performance. Every idea and theory postulated in the book's pages is supported in lucid and exhaustive detail by his personal engagement with specific productions, films and recordings of opera experienced over the span of a lifetime. The book manages to address both the knowledgeable opera scholar and the simply devoted opera fan. For a work of such seriousness of purpose, it is a highly entertaining read and downright funny at times. 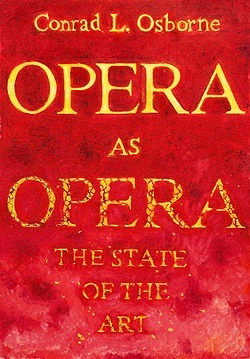 Opera as Opera is basically a Must Have Book for any lover of the genre.